WHY CHOOSE THESE FLOOR DOOR STOPPER ? .Easy to fit and does the job, no frills-style door stop. All you need is a screw driver. .These are great for holding a door from moving in the wind, like the door in the garage work room. .This doorstop Solid, functions great and good-looking - a high quality product. .Works great to hold open the door at just the right angle. .Easy to install with 2 screws. .Easy Install - Installation is to first drill a hole in the floor the same diameter as the protruding post at location for placement of the door stop. This puts the fixture in a snug fit and the mounting screw is then attached. .This quality door holder is constructed from stainless steel and rubber bumper, comes with mounting screws. .This holder works best when it is installed on the floor. .You can purchase these floor door stopper to keep partially open doors from slamming in the summer afternoon breeze. The rubber bumper is hard enough. This door stopper suitable for 0.08" to 0.77" gap, please kinldy check your door gap before you purchase it. This is to keep a door at opening from hitting an oversize enclosure fixture-- the double screw mounting design would be sufficient rigidity of the fixture on the floor. This door stop works great. The mounting post makes it a super well designed little device--and it is rock solid and is precisely the unit to have if the application and design are what you are looking for. 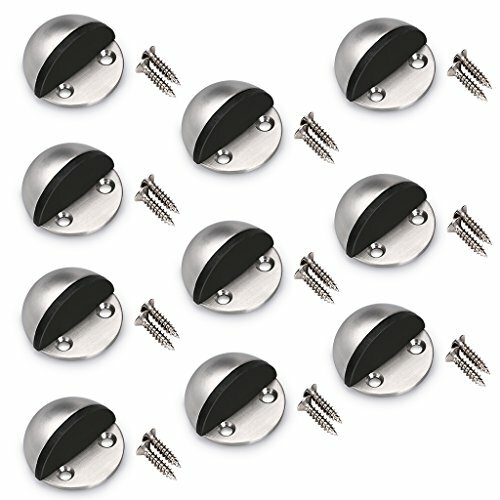 These floor door stoppers are stainless and they have a rubber front to help with the impact too. Floor mount will keep the door from crashing into the wall. You don't worry that kids or wind to open and slam the door to the point of hitting the wall. This door stopper suitable for 0.08" to 0.77" gap, please kinldy check your door gap before you purchase it.